Abhishek Bachchan is the son of Bollywood superstar Amitabh Bachchan and actress turned politician Jaya Bhaduri. His grandfather, Harivansh Rai Bachchan, was a well-known poet of Urdu and Hindi literature. 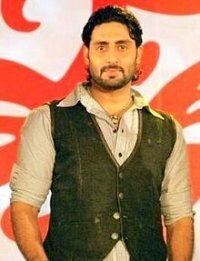 The original last name of Abhishek's parental family is Srivastav, Bachchan being the pen name used by his grandfather. However, when his father Amitabh entered films, he did so under his father's pen name. He is of Punjabi Sikh heritage from his grandmother Teji's side, while also of Bengali Kulin Brahmin descent from his mother Jaya Bhaduri's side. Abhishek attended Jamnabai Narsee School, Bombay Scottish School in Mumbai, Modern School in Vasant Vihar, New Delhi and Aiglon College in Switzerland. He then went to the United States to complete his education at Boston University but then left the course mid-way to pursue his acting career when his father Amitabh Bachchan's company ABCL was facing trouble. Abhishek began his career with J.P. Dutta's moderately successful Refugee along with Kareena Kapoor in 2000. In a span of four years, Bachchan went on to do many more movies, without any major box-office successes. 2004 was a good year for him. His performance in Mani Ratnam's Yuva, proved his mettle as an actor. The same year, he starred in Dhoom which was his first major hit. In 2005, he shot to fame with four consecutive hits: Bunty Aur Babli, Sarkar, Dus and Bluffmaster. He won his second Filmfare Award in the Best Supporting Actor category for Sarkar.Bachchan also received his first Filmfare nomination in the Best Actor category for Bunty Aur Babli. His first 2006 release, the multi-starrer Kabhi Alvida Naa Kehna (2006) was one of the highest grossing films of the year. He was also a part of Mani Ratnam's stage show, Netru, Indru, Naalai alongside many other co-stars. His second release Umrao Jaan failed to do well at the box office. His third release Dhoom 2, a sequel to his first hit Dhoom did very well at the box office. His first release in 2007 was Guru. He has received much acclaim for his performance and the film emerged as his first solo hit. He recently made a brief appearance in the multi-starrer Shootout at Lokhandwala which released in May 2007; the film was successful. His next release Jhoom Barabar Jhoom released in June 2007. The film under-performed in India but did better overseas especially in the U.K. However while the film received mixed reviews, Bachchan received good reviews for his performance in the film. In 2008 Abhishek Bachchan will join Amitabh Bachchan, Aishwarya Bachchan, and other Indian film actors on the world-wide Unforgettable Tour. The tour will reportedly cover 18 countries and 6 continents. Abhishek with wife, Aishwarya Rai Bachchan at the India Splendour event in Los Angeles (2007)Abhishek Bachchan was earlier engaged to Karisma Kapoor. The couple announced their engagement on Amitabh Bachchan's 60th birthday celebration in October 2002. The engagement was called off in January 2003. Gossip columnists have linked Abhishek to many industry figures, but he strongly denied most rumours of romance. In 2005, Abhishek was said to be dating the Indian model Dipannita Sharma. A year later news surfaced about his relationship with Aishwarya Rai - his co-star in several movies. After much speculation concerning their relationship, his engagement to Aishwarya Rai was announced on January 14, 2007. The announcement was later confirmed by Amitabh Bachchan. Abhishek married Aishwarya on April 20, 2007 according to traditional Hindu rites of the South Indian Bunt community, to which his wife belongs. Token North Indian and Bengali ceremonies were also performed. The wedding took place in a private ceremony at the Bachchan residence Prateeksha in Juhu, Mumbai. Though the wedding was a private affair intended for the Bachchan and Rai family and friends, the involvement of the media made it a national extravaganza.